During my last day in Bangkok, my friend and I went for a last minute shopping spree. Since we did not shop together, we ended up at different shopping malls! We had checked out of Pinnacle Lumpinee Hotel earlier in the morning. But time just flew so fast that before I knew it, it was time to go to the airport! We had to catch our flight back to Malaysia at 5.30pm and it was already 1pm! Since I was hungry, I decided not to wait for my friend and quickly scouted around for my lunch. Somehow, I ended up at Siam Square and saw this Japanese restaurant called Chabuton. 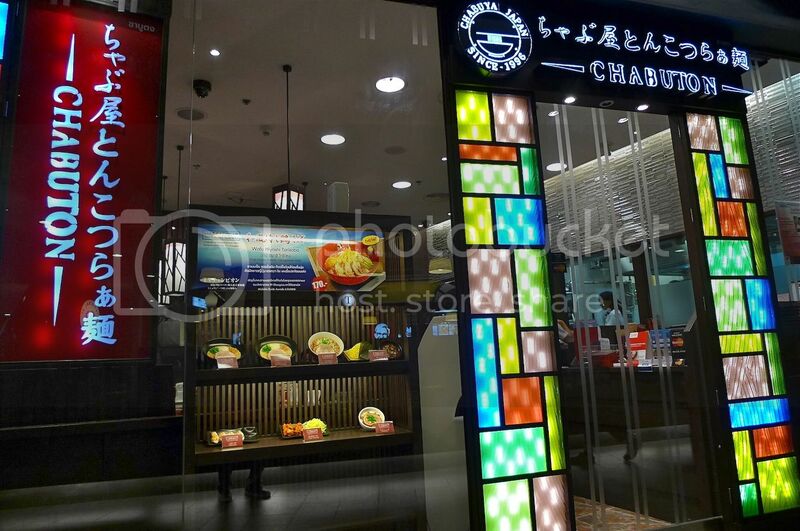 I had seen another Chabuton restaurant at Terminal 21 shopping mall during my second day in Bangkok and was tempted to eat there at that time. The above picture was taken at Terminal 21. I did not take a picture of the Chabuton outlet in Siam Square. Anyway, I went in all alone and after being greeted by the friendly staff there, I was shown an empty table. There were many customers inside the restaurant. Not surprising since it was the lunch hour. 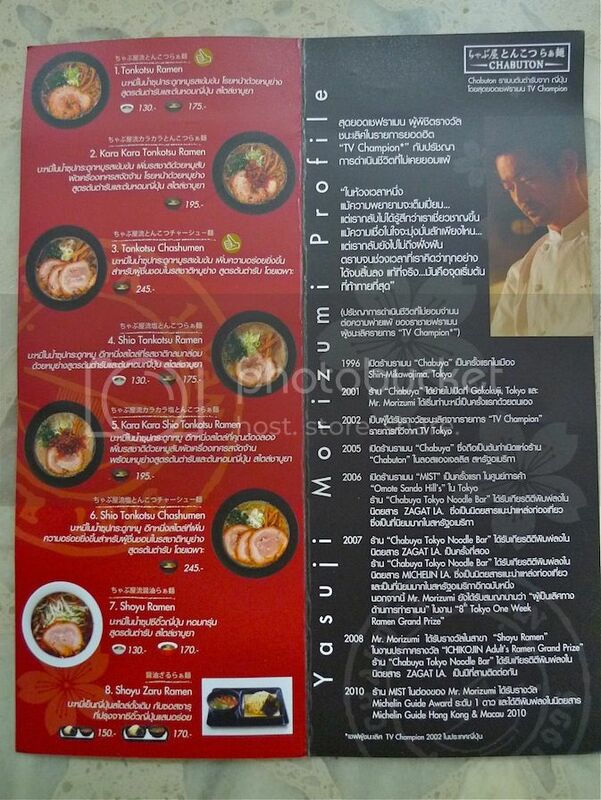 I picked up a brochure which gave some details about the restaurant. Unfortunately, it's all written in Thai language! However, later while waiting at the airport, I googled and found out that the ramen dishes in Chabuton were created by renowned TV Champion (2002) Best Ramen Chef Yasuji Morizumi. Apparently, they have many outlets in Japan and Thailand. Wonder when they are going to open one in Malaysia? I ordered the Tonkotsu Ramen (small) priced at 130 baht (USD 4.25). The noodles were springy but not really chewy and the soup was tasty and creamy! And what I liked best was of course the thinly sliced pork belly which almost melted in my mouth. Yum! 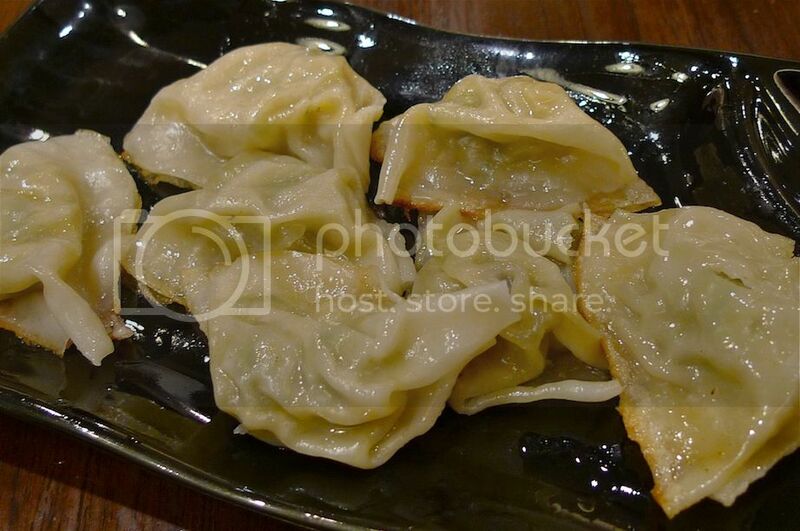 I should have ordered the big bowl (which costs 175 baht) but I guess it's wiser not to since I could use some stomach space to try their gyoza. 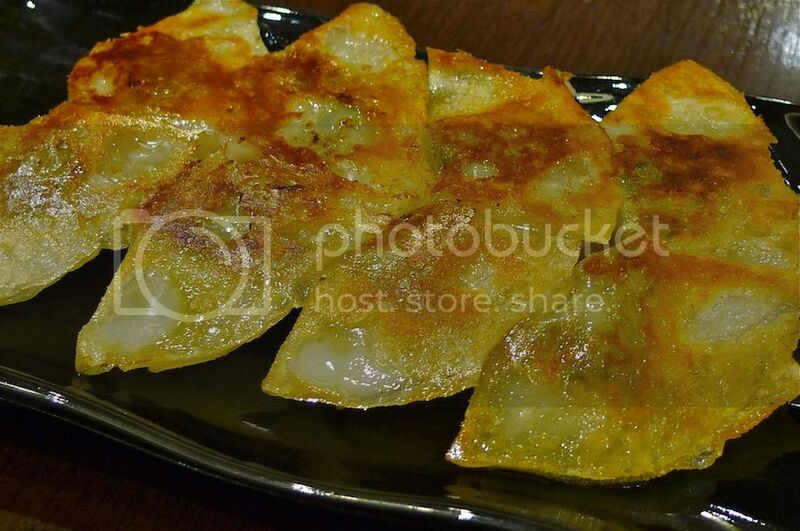 The pan fried dumplings came in 8 pieces and were priced at 115 baht (USD 3.70). They were yummy! I turned them around before taking another picture. I thought they looked more delicious this way. LOL. 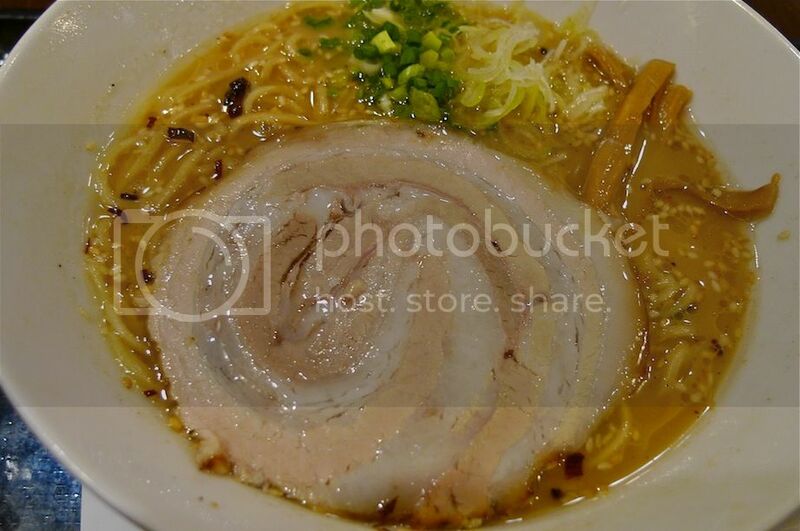 I do not mind visiting Chabuton again to try the other types of ramen dishes there. Well, from the menu, they seem to have 8 different types. After my lonely lunch (which I actually enjoyed) I reunited with my friend back at our hotel. It's too bad he could not join me for lunch at Chabuton. Maybe next time. We needed to get our luggage and make our way to Suvarnabhumi Airport fast!